I am forever grateful to my super lovely host and hostess for making this impromptu road trip possible; for opening their lovely home to not just me, but to my surprisingly well-behaved dog (except for that moment of panic when I realized she was no longer in the backyard and had wandered ACROSS THE STREET – I ran outside barefoot and almost had a heart attack! ); for just being all around awesome people to board a stray food blogger with a lot on her mind AND her dog, to listen to that same food blogger blab on and on about everything… seriously. The bestest people in the world who obliged my request to just live normally… I wanted to see what it’s like to be part of a normal family and life for once, and they totally embraced this. Thank you, from the bottom of my heart, Aimee & Dean!!! You are both awesome and I am eternally in your debt. Since I said I wanted to see what it’s like to be part of a normal family and life, they wanted to show me how it’s done where they live. By which I mean… they do something I’ve always wanted to do myself, but have never gotten around to in my years of food blogging: they grind their own meat. A couple of pounds of steaks from Costco… I forget what cut they said it was. Dean laughed at me when I asked if he leaves the fat in. We agreed that it’s the best part! Here he’s slicing it up. After a bit of time in the freezer, here it is going in the grinder attached to the Kitchen Aid. 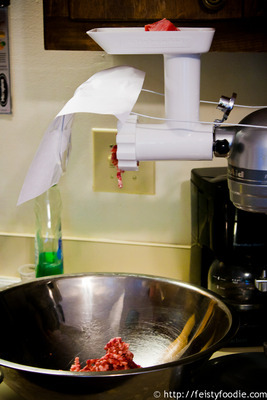 The weird contraption you see on it is to prevent the blood from spattering everywhere, because it turns out that freezing is meant to help the blood not spatter… but doesn’t always work. And at the end of it all… beautifully fresh ground meat that just smelled so awesome (yes, I like the smell of raw, fresh, bloody meat… sue me). 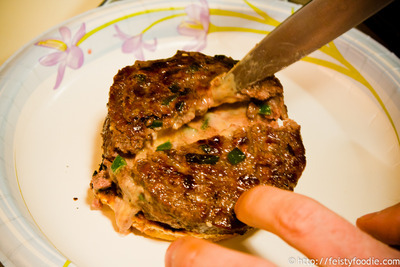 The first night, Dean made Juicy Lucy’s, or burgers with cheese inside. 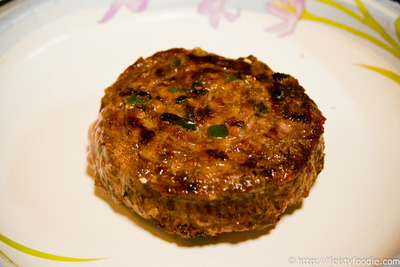 His had the addition of fresh jalapenos (as you see pressed into the top). Aimee made a side of beans… I forget what she called them, but she told me you cook ground meat a bit, adding seasonings, then add it to different cans of beans to make it your own. 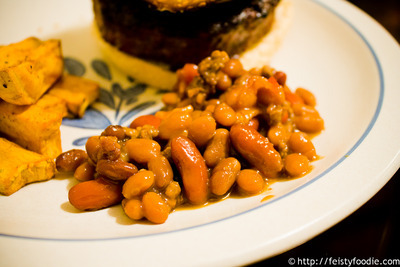 Tasty, hearty side. She also sliced up some sweet potatoes – NC is sweet potato state, I didn’t know that! 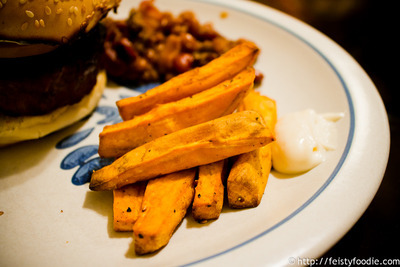 – tossed them with olive oil, salt/pepper and paprika, then baked them to make healthy sweet potato fries. I wasn’t sure I’d like them since I’m not a big sweet potato person, but these were fantastic – and on the side, a bit of maple aioli (maple syrup mixed with mayo, that’s it). So good!!! My burger was topped with a slice of those awesome tomatoes, and a slick of mayo of course (per my usual). The cheese oozed out happily when I bit into it, molten lava hot, so be careful! But this was so good. 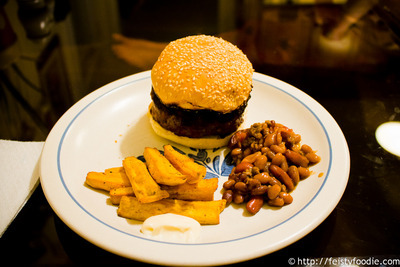 I really want to stuff my burgers with a bit of bacon too… nom nom nom… I surprised myself by eating the whole thing. Given my rather weak appetite lately, this was impressive to me! 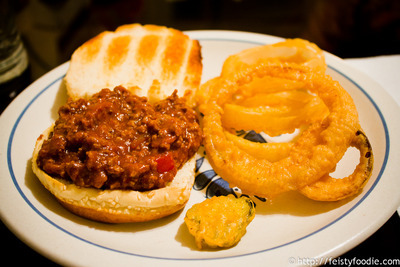 And the next night, continuing our “normal family” routine, we had sloppy joes… and homemade onion rings and fried pickles. Oh my stars. I’d happily move in with Aimee & Dean if they would have me (she just told me she’s making country fried steak and mashed potatoes tonight… I don’t know how they’re not both as big as a house…). Fantastic, stick-to-your-ribs food, along with fabulous company, people you can just relax with and shoot the breeze with… this was one of the most perfect road trip vacations I’ve taken in quite a while. quite impressive Aimee & Dean! 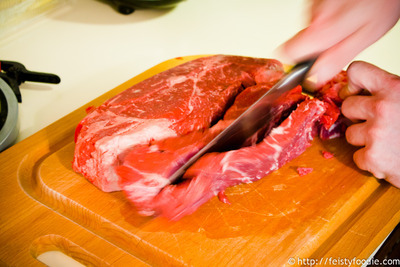 I don’t see myself ever grinding my own meat. Never had a juicy lucy before. Seen them on TV a lot and I think a couple places in NYC have them. They could be more dangerous than soup dumplings with all that hot cheese. I haven’t seen them on NY menus- do you remember any of the places you saw? What a wonderful trip! Awesome hosts! Aimee & Dean, I am coming next. LOL! 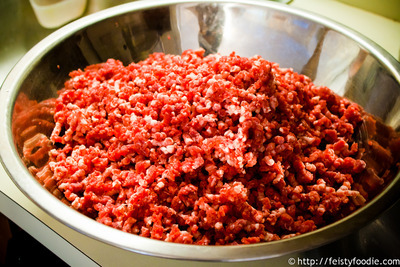 And grinding one’s own fresh groundmeat is awesome. I do this too. Love that KA! Dunno what the plates are called but I’ve eaten plenty of meals off them in the past decade. I’m thinking Juicy Lucy meatballs. Maybe dial back the relative amount of cheese a bit, but the same concept. Wow. 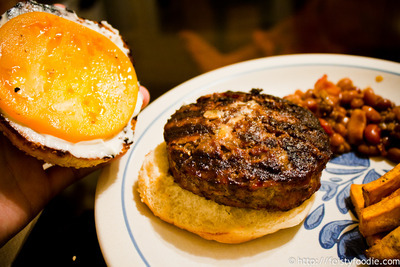 I so want Juicy Lucy and Sloppy Joe nights. It all sounds really good. Glad A&D were so wonderful to you. I love how family life revolves around good food. I grew up that way and it’s awesome! If you’re already shopping at costco, they have Kirkland Crumbled Bacon which is like 50% less fat than normal pan-fried streaky bacon. I keep a sack of it at home to make bacon and eggs (or bacon and mac & cheese, or bacon & alfredo sauce, or anything that benefits from a shot of bacon). 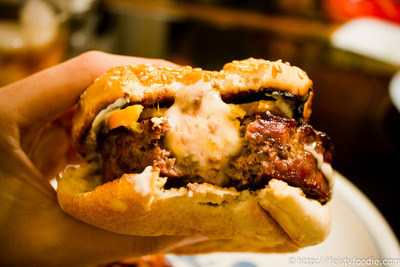 That sounds like the perfect way to augment a juicy lucy as all the work for you.